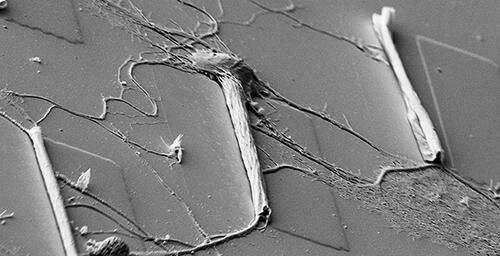 (Nanowerk News) Tiny, thin microtubes could provide a scaffold for neuron cultures to grow so that researchers can study neural networks, their growth and repair, yielding insights into treatment for degenerative neurological conditions or restoring nerve connections after injury. Researchers at the University of Illinois at Urbana-Champaign and the University of Wisconsin-Madison created the microtube platform to study neuron growth. They posit that the microtubes could one day be implanted like stents to promote neuron regrowth at injury sites or to treat disease. "This is a powerful three-dimensional platform for neuron culture," said Xiuling Li, U. of I. professor of electrical and computer engineering who co-led the study along with UW-Madison professor Justin Williams. "We can guide, accelerate and measure the process of neuron growth, all at once." The team published the results in the journal ACS Nano ("Toward Intelligent Synthetic Neural Circuits: Directing and Accelerating Neuron Cell Growth by Self-Rolled-Up Silicon Nitride Microtube Array"). "There are a lot of diseases that are very difficult to figure out the mechanisms of in the body, so people grow cultures on platforms so we can see the dynamics under a microscope," said U. of I. graduate student Paul Froeter, the first author of the study. "If we can see what's happening, hopefully we can figure out the cause of the deficiency and remedy it, and later integrate that into the body." The biggest challenge facing researchers trying to culture neurons for study is that it's very difficult to recreate the cozy, soft, three-dimensional environment of the brain. Other techniques have used glass plates or channels carved into hard slabs of material, but the nerve cells look and behave differently than they would in the body. The microtubes provide a three-dimensional, pliant scaffolding, the way that the cellular matrix does in the body. The team uses an array of microtubes, made with a technique pioneered in Li's lab for electronics applications such as 3-D inductors. Very thin membranes of silicon nitride roll themselves up into tubes of precise dimensions. The tubes are about as wide as the cells, as long as a human hair is wide, and spaced apart about as far as they are long. The neurons grow along and through the microtubes, sending out exploratory arms across the gaps to find the next tube. Froeter devised a way to mount the microtubes on glass slides, the standard for biological cultures. The thin silicon nitride tubes are transparent, so researchers can watch the live neuron cells as they grow using a conventional microscope. "Having the ability to see through both the tube and the underlying substrate has been really enlightening," said Williams, a professor of biomedical engineering at UW-Madison. "Without this we may have noticed an overall increase in growth rates, but we never would have observed the dramatic changes that occur as the cells transition from the flat regions to the tube inlets." The microtubes not only provide structure for the neural network, guiding connections, but also accelerate the nerve cells' growth - and time is crucial for restoring severed connections in the case of spinal cord injury or limb reattachment. Because they are so thin, the microtubes are flexible enough to wrap around the cells without damaging or flattening them. The researchers found that the axons, the long branches the nerve cells send out to make connections, grow through the microtubes like a sheath - and at up to 20 times the speed of growing across the gaps. "It's not surprising that the axons like to grow within the tubes," Williams said. "These are exactly the types of spaces where they grow in vivo. What was really surprising was how much faster they grew. This now gives us a powerful investigative tool as we look to further optimize tube structure and geometry." The microtube arrays can be tuned to any dimensions needed, since nerve cells vary greatly in size from small brain cells to large muscle-controlling nerves. Li and Froeter have already sent microtube arrays of various dimensions to other research groups studying neural networks for diverse applications. For Li's group, the next step is to put electrodes in the microtubes so researchers can measure the electrical signals that the nerves conduct. "If we place electrodes inside the tube, since they are directly in contact with the axon, we will be able to study signal conduction much better than conventional methods," Li said. They also are working to stack the microtubes in multiple layers so that bundles of nerves can grow in a 3-D network. "If we can grow lines of neurons together in a bundle, we could simulate what's going down your spine or going to your limbs," Froeter said. "Then we can take mature cultures and sever them, then introduce the microtubes and see how they regrow." "Getting to the clinic will take a long time, but that is what keeps us motivated," Li said.